← Pittsburg, Pennsylvania. June 2nd, 2011. Buffalo, New York. June 2nd, 2011. 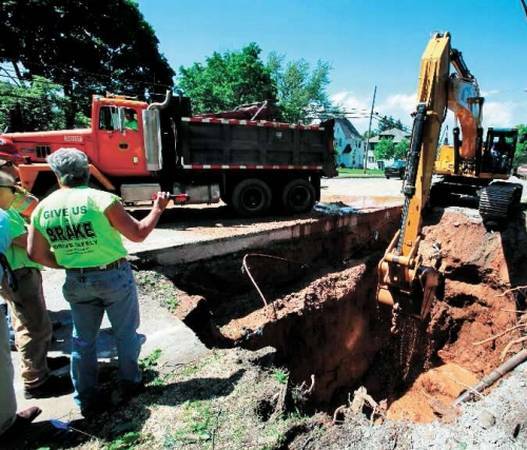 LOCKPORT—The cause of the sinkhole blocking traffic on South Transit Street was the cave-in of a century-old clay sewer main, City Director of Engineering and Public Works Norman D. Allen said Wednesday. The soil above the 30-inch main, which is located some 26 feet below street level, collapsed Tuesday afternoon. Mayor Michael W. Tucker said Wednesday that traffic in both directions on South Transit, which is part of Route 78, will be barred between Willow and Summit streets until at least Saturday. Allen said a 6-inch water line broke Wednesday afternoon during digging to reach the sewer line. He said the break was expected, given that the water pipe was positioned in the hole about 20 feet above the sewer main. Allen said a valve had been installed on the water line Tuesday to make it easier to turn off and reroute the water, and nearby customers were without water service for only a couple of hours Wednesday. He said pumps are being used to keep sewer service viable. “We’re pumping from a manhole upstream [from the break] to a manhole downstream,” Allen said. However, one 6-inch pump proved inadequate, as a pool of water and sewage three to four feet deep gathered in the bottom of the hole. Wednesday from Godwin Pumps of Batavia, a supplier to Yarussi Construction Co. of Niagara Falls, which is performing the excavation and repairs. After digging, the hole, which started out 12 to 15 feet wide, is now 30 by 15 feet at the surface, Allen said. The pavement, which did not buckle, had to be broken during the repair work. Allen said the sandy soil in the area was weakened by the steady rain through most of May, contributing to the movement that created the sinkhole, which started between the sidewalk and the curb on the east side of the street. “The clay pipe might have been broken for years and years,” Allen said. He said the line has been explored with remote- control TV cameras, and the only break appears to be the one at the sinkhole. “I think we can get it repaired by the weekend,” Allen said. This entry was posted in Pictures and tagged Buffalo, Buffalo New York, New York, sinkhole, South Transit Street, Transit Street Sinkhole, water main. Bookmark the permalink.